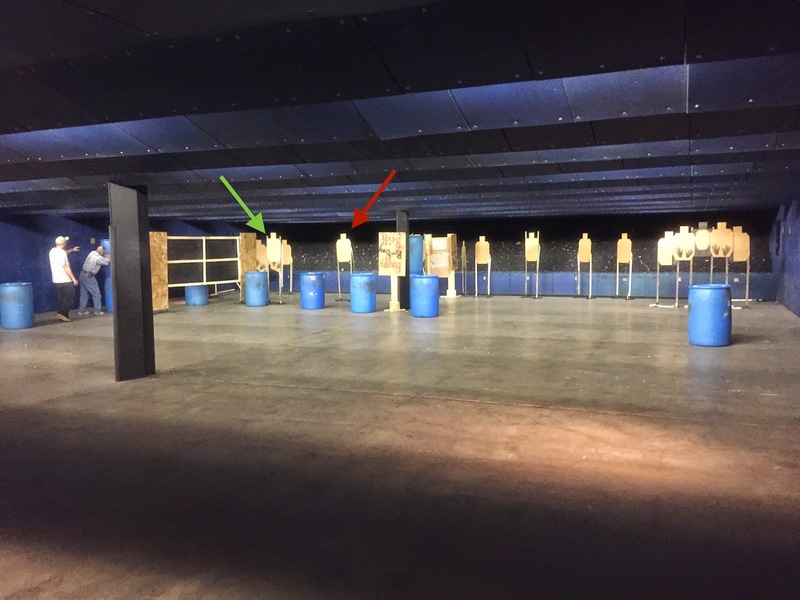 I finally made it back down to the Tuesday evening Colonial Shooting Academy IDPA match. The last time I was there was March 17, St. Patrick's Day. I realized this match day happened to fall on Cinco de Mayo, another drinking holiday excuse. I prefer shooting to over-indulgence. The first stage of the match involved downloading all the magazines to six rounds and leaving them staged on barrels. The unloaded gun was also left on the first barrel. Starting seated, you retrieved and loaded the gun, engaging the six targets as you moved down range. Unfortunately, as I turned to engage my third target, I zeroed in on the first target of the second stage! I should have taken another step to the right to see the proper target. That cost me two misses and a Failure To Neutralize penalty. Ouch! D'oh! Shoot where the green arrow is, not the red. That misstep behind me, I moved on to Stage 2, where the target I neglected to shoot previously stood mockingly at the starting position. There were five targets arranged across the stage which could be shot on the move across the stage, or while stationary from a couple positions. The final and sixth target was hidden behind a vision barrier at the end of the stage. Finishing the stage 3 points down, I was pretty happy with that run, although I fumbled my reload. I started to reload on the move, but hesitated when I became unsure if I could, and then started to pocket instead of dropping the empty mag. I imagine it looked like I was doing a bit of two-step around the barrel. The final stage was a simple stage that began facing up range, and the gun loaded with just 6 rounds. At the start you turned and put two hits on each target, performed a mandatory reload and engaged each target with two more rounds. After the stumbles on the first two stages, I had little to lose at that point and just ran with it. Even though I ended up 5 points down, I placed well on the stage. At least that helped to offset the first stage errors a little. Despite some less than satisfactory shooting, I had a good time. After all, the reason I play the game is to get in practice with the gun and to have fun. And both of those goals were met.